The following post comes from Karen Harwell, CBF missional congregations associate, as the beginning of a week-long series on chaplaincy and pastoral care. 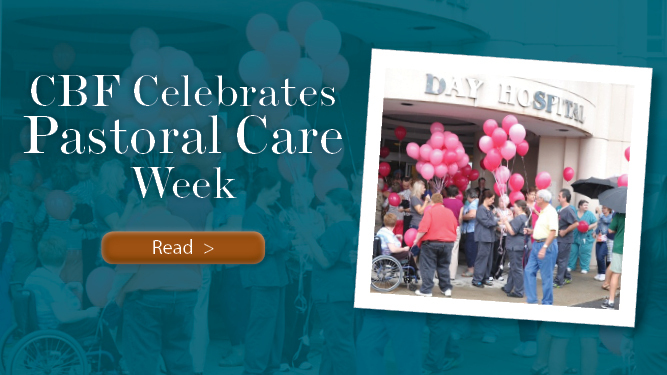 Since 1985, the Congress on Ministries in Specialized Settings (COMISS) has celebrated Pastoral Care Week. The week-long observance provides opportunities to highlight the stories of chaplains and pastoral counselors around the world and to honor their ministries. The theme for 2013 highlights the Prophetic Voice of those who provide pastoral care. In honor of the Cooperative Baptist Fellowship’s over 725 active and inactive chaplains and pastoral counselors endorsed by CBF, a series of blogs will run on the CBFblog throughout the week. We have asked seven of our chaplains and pastoral counselors to reflect on stories from their ministries—places where they have seen God at work. Join us in hearing the stories of our ministers providing hope in the midst of crisis, standing beside others during the various stages of life’s journey and answering God’s call to ministry. In addition to the blogs, members of CBF’s Chaplaincy and Pastoral Counseling Facebook Group will be able to join in prayer together each morning. Monday through Friday, a CBF staff member or member of the Council on Endorsement will post a prayer for chaplains. We encourage you to log in each day to read the prayers on your behalf and to pray for each other! Prayers will be posted during the week from Bo Prosser, Jim Pope, Suzii Paynter, Chuck McGathy, and Karen Harwell. Selected prayers from the week will also be posted to the CBF Facebook page throughout the week. now. But, what in regards to the conclusion?